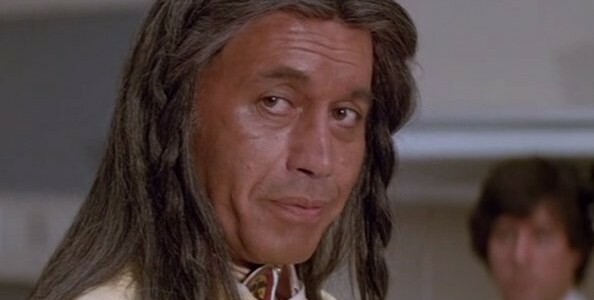 It’s the sort of flaky coincidence I would dismiss as a transparent contrivance if I encountered it in a movie: Just a few days before the passing of Michael Ansara – the Syrian-born actor who credibly and creditably played dozens of Native American characters in movies and TV shows during the 1950s, ’60s and ‘70s – I just happened to be talking with a colleague about The Manitou, a cheap-and-cheesy 1978 horror flick in which Ansara maintained an admirably straight face while co-starring as a modern-day medicine man. I respectfully refrained from mentioning The Manitou when I wrote an obit for Ansara this past weekend – just as I avoided listing it among the deceased’s credits back when I wrote an obit for Tony Curtis, the film’s nominal star. But as my colleague and I agreed, The Manitou is hard to forget – for all the wrong reasons. One of several supernatural disasters that provided easy paychecks for fading stars and eager up-and-comers in the wake of The Exorcist, the movie deals with a 400-year-old Indian shaman – Misquamacus by name – that returns to the land of the living in the form of a fetus unnaturally attached to the back of an innocent young woman. Susan Strasberg gamely plays the hapless host for the fetus, Stella Stevens (decked out in dark body makeup even less convincing than said fetus) does an embarrassing cameo as a fortuneteller stuck with rather unfortunate dialogue – “What’s we’re dealing with here is… black magic!!! ” – and Tony Curtis chews up his lines, the scenery and a few unlucky bit players as a phony spiritualist accidentally involved in the battle to smash Misquamacus. No, really, I’m not making that up: Just look at this video around the 1:31 mark. You might also want to watch the rest of the movie while you’re at it. But trust me: It isn’t any better. Manitou is a camp classic. I'm surprised it hasn't been remade. Shhh! Don't give them any ideas!